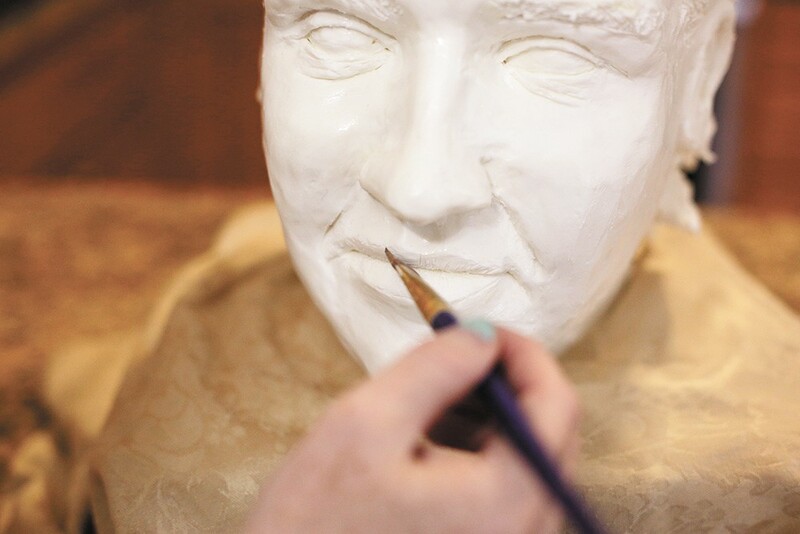 Becky Wortman discovered her talent for sculpting buttercream frosting in pastry school. Michelangelo carved the Pietá from marble. Chef Becky Wortman used butter. Specifically, the Spokane-area chef and edible sculpture artist used a hunk of dense buttercream frosting to recreate one of the Renaissance icon's most famous works, depicting the crucified body of Jesus draped across Mary's lap. Though the two media starkly contrast, it's hard to spot differences between Michelangelo's stone and Wortman's sugar. The cascading folds of Mary's robes ripple just as gracefully, like liquid silk, in both depictions. "I've always wanted to go to Italy, so I thought 'I'll just make it myself,' and it came out really beautiful," Wortman recalls of her petite Pietá, carved at a chocolate show in Chicago several years ago. "I like the Greek and Byzantine and Roman sculptures, so when people saw it, they thought 'Is that cake?' but no, it's solid frosting," the chef continues. "I thought, 'You know, there's something to this,' if you mix frosting a different way and with different recipes it [holds] up to temperature and you can carve it." Wortman's other buttercream recreations of classical sculptures are equally stunning replicas. She's been inspired to sculpt versions of many other stone statues erected in historic cemeteries and buildings around the world. Her favorite subjects to carve are people, especially faces, and animals. Buttercream frosting is traditionally made from four main ingredients: butter, powdered sugar, milk and flavoring. For obvious reasons, Wortman doesn't want to share exactly how she makes her special sculptable frosting, but says temperature maintenance is key to keeping the medium in a workable consistency. When carving finer details, for example, the chef chills her sculptures to keep the frosting from becoming too soft. Chef Wortman recently practiced her technique by making this buttercream bust. And though her sculptures by all appearances seem too magnificent to eat, many of Wortman's creations are indeed made for consumption, serving as event centerpieces that guests can dip various treats into. And when certain steps are taken, she says other pieces not intended for eating can be displayed for up to two years before the frosting goes bad. Since her own fateful creation of the Pietá, Wortman's profile as a food artist — using arguably one of the most unique single ingredients — has skyrocketed, taking her around the country to industry shows, competitions, high-end private events and even Food Network appearances, including on the popular show Halloween Wars. Due to the delicate nature of her work, Wortman always sculpts on site, occasionally offering people the chance to see her art in progress. Her most elaborate piece to date is a 250-pound solid buttercream sculpture of a lion and a winged angel, based on a monument she'd seen in a British cemetery, created for the Tulsa Interstate Fair, one of the biggest fairs in the U.S.
"That was in a huge refrigerator, and I was eight hours a day sculpting in front of people. I wanted to get it done fast, but they were paying me to do it and said, 'You need to slow down because you have a week,'" she recalls. Preferring to work at a faster pace and finish most projects in a day or two, that project challenged Wortman's patience, as well as her dislike of being in the spotlight. "I don't want the attention," she says, explaining that when she doesn't have to sculpt in front of an audience, once finished she likes to take off her chef coat and sneak in to see people's reaction to her work. "The smiles on their faces are just priceless to me. That's why I do it. That's the fun part." Although you'd never guess it by looking even at Wortman's earliest buttercream sculptures, the chef hasn't had any formal training — or even a self-taught background — in sculpting techniques. She discovered her own remarkable talent almost by accident while taking classes in Spokane Community College's professional baking program. Enrolling to take advantage of her soon-to-expire GI Bill benefits, Wortman found she didn't enjoy commercial baking's repetitive nature while learning industry standards for breads and cakes. "I hated the fondant stuff, and so I started to experiment with frosting and what I could do," she recalls. "I've never sculpted before this — not ever. I've done paintings here and there, but never have I sculpted before, so I started playing with frostings." Students in the program were required to attend a cake-decorating competition in Seattle, which is when everything changed for Wortman. "I really didn't want to make cake," she says. "My instructor put a brick of frosting in front of me and said 'Go to work.' That's kind of where it blew up." Since graduating from SCC's baking program in 2013, Wortman has also been recognized with many accolades; being named one of the top 10 cake artists in North America by Dessert Professional magazine and being asked to join a team for the World Food Championships. After this whirlwind of success, however, Wortman decided to take a step back about a year and a half ago. She was traveling regularly to create buttercream sculptures for clients around the U.S. and still has two young daughters at home. At that time, her husband was also working semi-remotely. "Going from two years of school to that, I was busy, busy, busy. It was like, you got a job but you didn't know you were getting a job," she says of the demand for her work and its irregular scheduling. In the time since, Wortman's personal interests have also expanded to include competitive powerlifting. She has big dreams to qualify for the 2020 Summer Olympics. "I'm eating my frosting, right?" she says, smiling. "I was like, 'I gotta change something up here.' I'm 38 now. I started to lose weight and become more fit while still doing the sculpting. 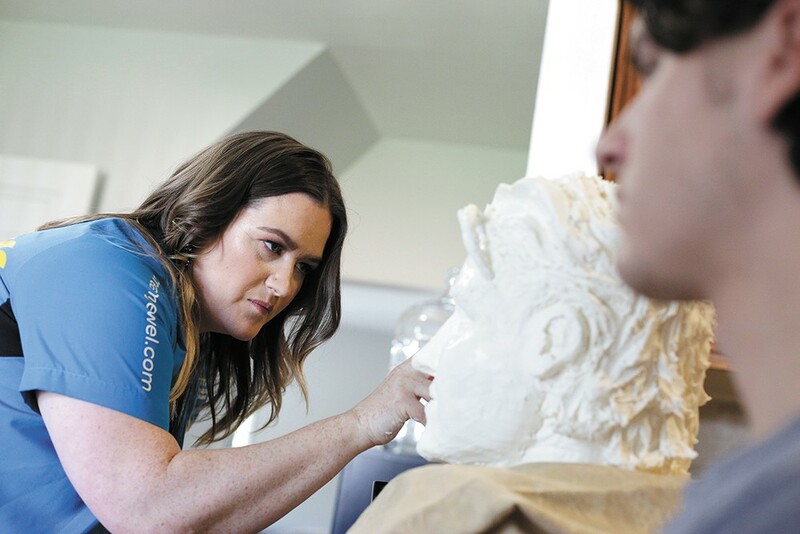 And when I sculpt, I learn about the body and muscles and tissue and bones, and when you're [weight training] you learn about that as well, so it's helped the sculpting." Though her priorities have shifted since that first fateful venture into the world of edible sculptures, Wortman still accepts occasional commissions and continues honing her techniques at home. She bakes and decorates wedding cakes on the side, too. Going forward, Wortman hopes to do more sculpting in the Inland Northwest as most of her clients are based on the East Coast. Follow chef Becky Wortman at creamjewel.com. The original print version of this article was headlined "Carved from Cream"
Sat., April 27, 6:30-10 p.m.